Use a cookie cutter and cut a round, heart or star shape from each bread slice. 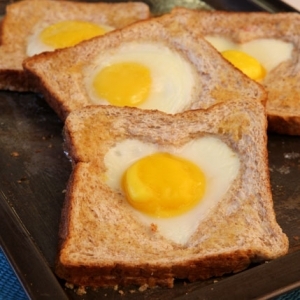 Place the bread slices on a greased baking sheet and break an egg into the cavity. Bake for 10-15 minutes or until the eggs are set. Place baking sheet in oven to heat up simultaneously with the oven. Then butter the sheet and place toast slices on baking sheet. The eggs will cook faster in the heated pan.